Thank you for joining the South End Tennis Club. We hope that your membership will provide you with many opportunities to enjoy the unique atmosphere our club has to offer, and meet other tennis enthusiasts throughout the summer. We ask that you take a few moments to review these rules and to keep them in mind when playing at the Club. The lock combination on the Gate is not to be shared with non-members. If there are no other members playing when you leave, please ensure that you secure the lock upon leaving the Club. Playing time is 60 minutes. If no one has claimed the court after your time has expired, you may reset the clock for 30 more minutes. The clocks on the sign up board are set to the time at which the players currently using the courts started playing. The next group starts 60 minutes after this. When "booking" a court hang your Membership Tag on the next available hook for the court you wish to use. If the bottom row is filled, the "next" row is the top row. When it is time for your group to play, reset the clock to the current time and proceed to the court. When leaving the courts do not forget to take your Membership Tag. If the courts are being used and if no Membership Tag is displayed, any member is well within their right to claim the court, unless you are aware that those using the Courts are members. No pre-booking of courts is permitted. If your playing partners have not arrived by the time the court is booked, the members booked for the next court may take the "open" court. The "bumped" parties may book the next "unsigned" court. Members may play with guests. Guest fees are $10 per day. Members can purchase guest passes in advance and packages of three passes can be purchased for $25. Guest passes can be purchased in advance by contacting any of the Board members. Payment for guests fees will be collected on an honour system. A guest book is located in the clubhouse. Please indicate the name of the member, the name of the guest and date played. Guest fees should be forwarded to any Board member in a timely fashion. A guest may play at the club a maximum of three times. Proper tennis shoes must be worn at all times while playing. Footwear that may damage the courts, ie. "cross-trainers" , basketball shoes, running shoes is prohibited. Please wear appropriate tennis attire. Shirts are to be worn at all times. Players should conduct themselves in a courteous and sportsman-like manner at all times. Should you have any concerns, please feel free to contact your board at [email protected]. The South End Tennis Club was established in 1890, making it one of the oldest such clubs in Nova Scotia and one of the oldest tennis clubs in Canada. There were originally five grass courts extending from Young Avenue to what is now MacLean Street. 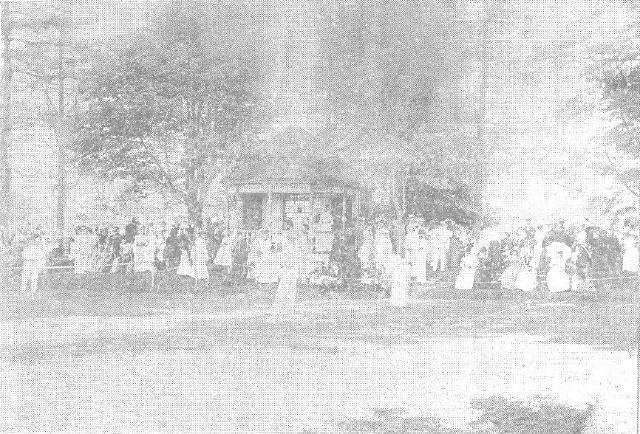 The land on which the club stood was purchased by a group of active members in order to save the club, each paying a small amount of cash and borrowing the balance against a first mortgage of $2,900. It did not take long for membership to grow, and by 1900 the club boasted 124 playing members and 59 tea members. Two years later the membership had increased to 193, consisting of 63 men, 67 women and 63 tea members. The original courts were grass before being changed to clay in 1911. Competition was always strong within the club and the South End Tennis Club did well in Provincial Tournaments, winning the "SilverBowl" trophy for many years in a row. The Club hosted the Nova Scotia Provincial tournament for the first time in 1907. During World War 1 the membership dropped considerably due to the number of male members who had enlisted for active service. By 1922 the membership had grown to 213. This included a Junior membership of 40. The financial position of the club was beginning to show strength for the first time in years. The club now had a cash balance. At the Annual meeting in 1922, it was suggested a Savings Bank account be established and a balance of $300.00 was put in, as a start of a Reserve Fund. In 1924 the Club pavilion was remodelled at a cost of $483.58 and a water line was installed for $49.00 plus trenching. It should be noted that it was forbidden to play tennis on Sundays until the bylaws were amended in 1929 finally permitting Sunday playing. Electricity was run into the clubhouse in 1952, and in 1956 the lower two courts were sold in to pay the taxes. In 1969 the court surface was changed to Har-tru until 1977 when they were converted to hard surface, as they remain to the present day.